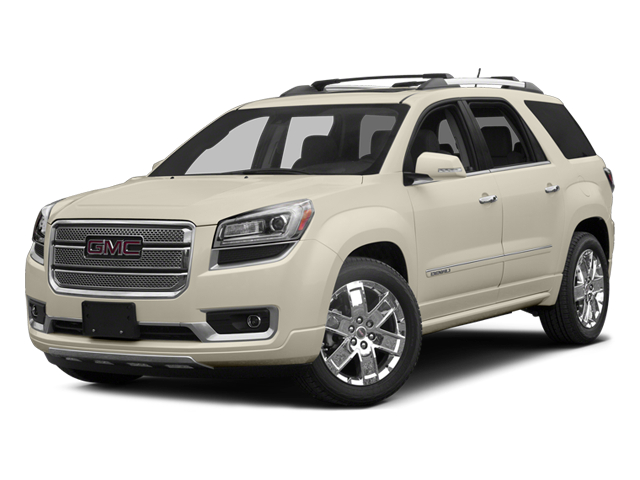 Leather Seats, Third Row Seat, All Wheel Drive, Quad Bucket Seats, Power Liftgate, Rear Air, Heated Driver Seat GMC Denali with White Diamond Tricoat exterior and Cocoa Dune interior features a V6 Cylinder Engine with 288 HP at 6300 RPM*. AUDIO SYSTEM, COLOR TOUCH NAVIGATION AM/FM/SIRIUSXM/HD RADIO WITH CD PLAYER IntelliLink, 6.5" diagonal touch-screen display, USB port and auxiliary input jack, WHEELS, 20" (50.8 CM) CHROME-CLAD ALUMINUM, LPO, BLACK ROOF RACK CROSS BARS, ENGINE, 3.6L SIDI V6 (288 hp [214.7 kW] @ 6300 rpm, 270 lb-ft of torque [364.5 N-m] @ 3400 rpm) (STD), TRANSMISSION, 6-SPEED AUTOMATIC (STD). Non-Smoker vehicle. "Though not radically different than before, the 2013 GMC Acadia should continue to deliver a winning combination of comfort, features, cargo space and performance in a utility-style package." -Edmunds.com. Reduced from $23,490. This Acadia is priced $1,800 below NADA Retail. Hello, I would like more information about the 2013 GMC Acadia, stock# HT8074B. Hello, I would like to see more pictures of the 2013 GMC Acadia, stock# HT8074B.